I have seen Popcorn, Indiana in stores before but had never tried it. When I got the chance to review it, I got really excited because I have been wanting to try the unique flavors. I am a fan of cheese popcorn but have not tried too many other crazy flavors. The bacon ranch is really neat and so is the smoked cheddar cheese. My absolute favorite out of these popcorns that I tried is the Sweet & Tangy BBQ Kettlecorn flavored. It is honestly addictive. The first time I opened it, I took a couple handfuls and then closed the bag. About 2 minutes later, I found myself opening it again and eating more and more! The popcorn is delicious. It has a thin sugary layer from the Kettlecorn part and then a nice dusting of the BBQ flavor. This popcorn has 130 calories for 2 1/2 cups which is not too bad. I WILL be buying this popcorn again. 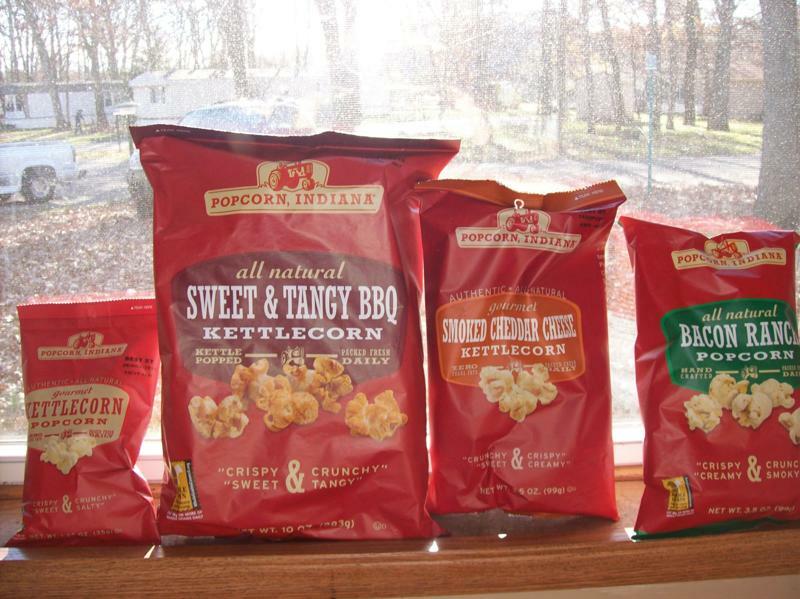 Thanks Popcorn, Indiana for the great samples! I'm assuming that this popcorn is made in Indiana, and I live in Indiana and have never heard of it. Go figure! Thanks for the follow! I'm returning the love!